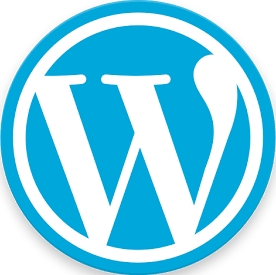 The NSMB Hacking Domain » New Super Mario Bros. Deluxe! New Super Mario Bros. Deluxe! 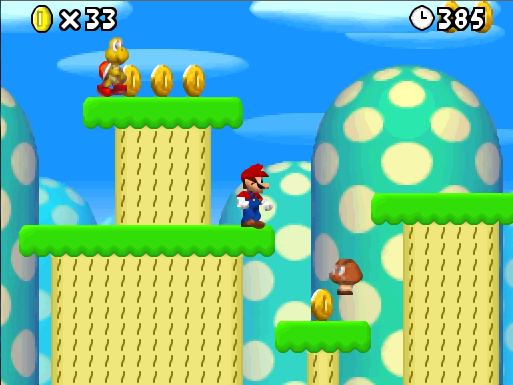 is a full New super mario bros. hack, which is a remake of "Super Mario bros. 1" and "The Lost Levels". 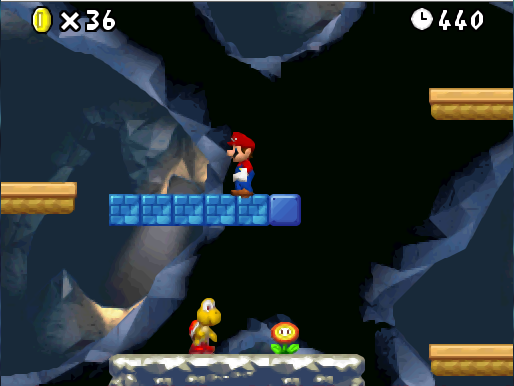 The original levels have been recreated faithfully, but thats not all! 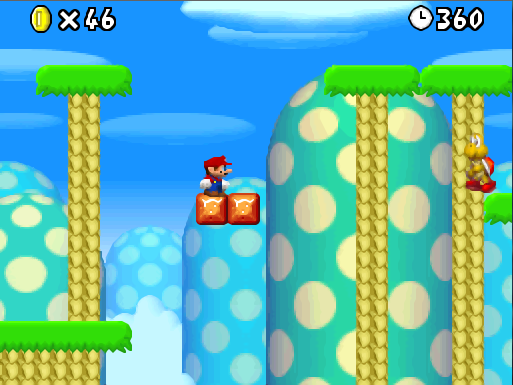 The first 5 worlds + some levels in World 7 (And one in World 6) have been expanded with custom areas. Level style varies from New Challenges, to Retro Inspired custom areas! The 5 cannons located in the game have been expanded, so now they are a full level, having at the end the warp cannon. 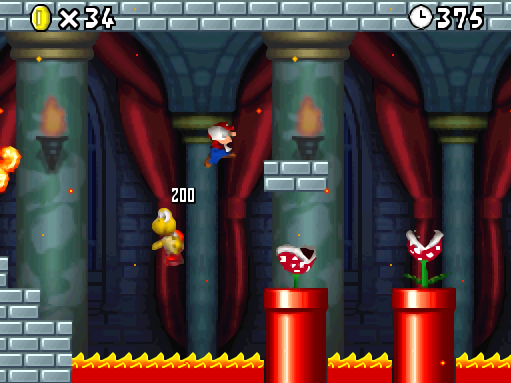 As a bonus, 4 of the best Super Mario Bros. Special levels are included, hidden as extra areas! The bowser Jr. fights have been modified to add more challenge. 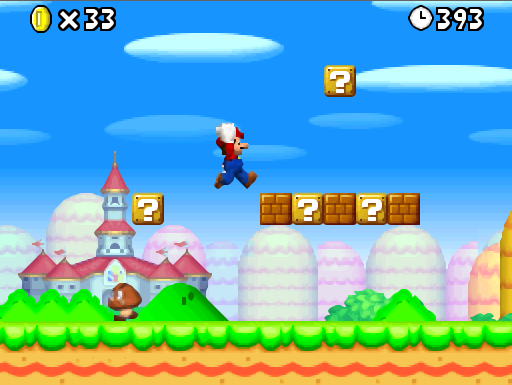 -The remakes includes all the levels from SMB1, and all the levels from TLL, including Worlds 9,A,B,C & D! 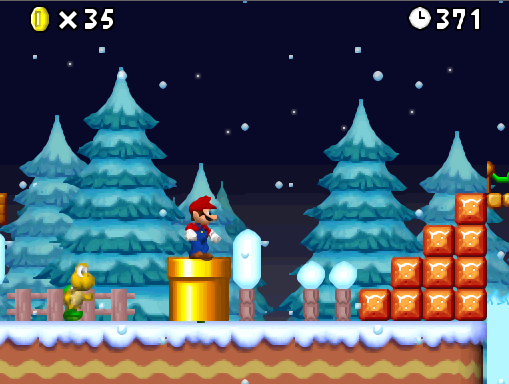 -To add the feel of the original games, both of the original retro graphics have been update to fit in with the NSMB style, while having the same look as the originals. 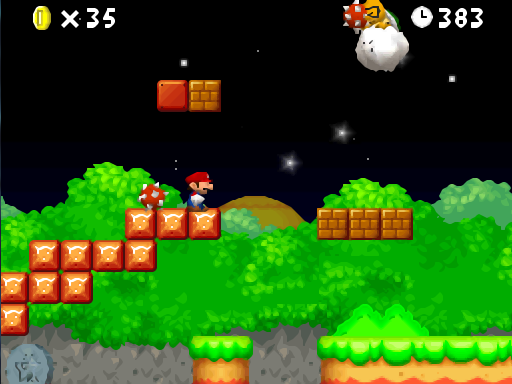 Plus, the original theme of the original levels have been preserved! 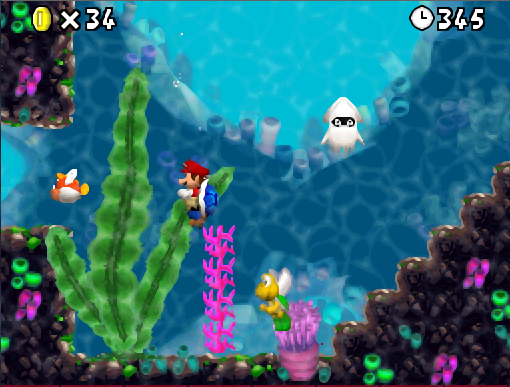 -New BGs such as the night time have been created to help set the mood of the original game, plus that NSMB feel. -And also, most UI suff have been changed, and the hack includes all brand new bottom screen backdrops! Remember, the patch will ONLY WORK on the U version of the ROM! Trimmed ROMs wont work! In the "Some Images" Compartment the images are in a vertical line, 'til deep down on the thread. I love the graphics of your hack. Please continue working on it. PLEASE. I have been adding more things, such as new areas & stuff. A suggestion when using No$GBA to take screenshots: You should set the color mode to VGA Poppy in the settings, or use DeSmuMe. I see some of your shots use the brighter palette, but most of them don't. Your tilesets look great, but maybe you could use custom graphics for the bridges instead of the flagpoles. I did not see a recolored lakitu? I came up with a bridge handrail GFX. 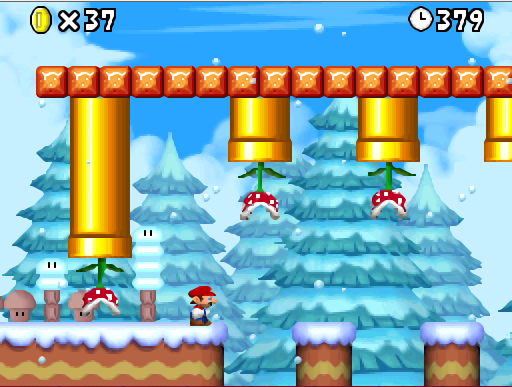 I made 2 options, based on SMAS and NSMB, so which one is better? I think the NSMB style is better. I agree, the NSMB style one is much better. I think the other style looks more great. I prefer the NSMB Styled one. New youtube channel, this one is hacks only lol. 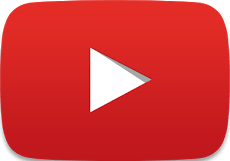 Will still be using my old youtube channel too. 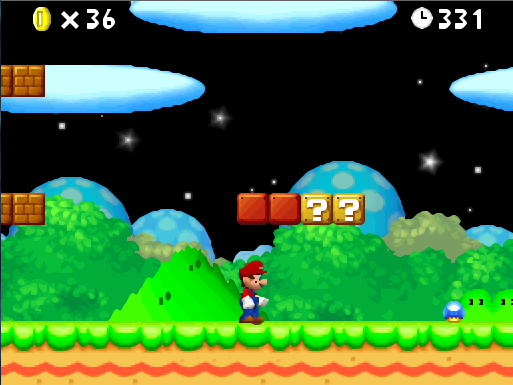 Ok then, ill use the nsmb style. However I feel like it has a lot of shading, compared to the platform it is. What is better, if I remove some of the shading, make a new bridge GFX, or leave it like this? Don't worry about it. It looks great. Gee, I never noticed you've gotten all the way to world 7!! From experience I know that is not easy. Good job. 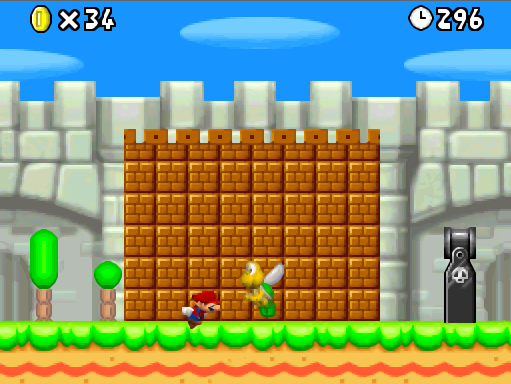 Actually, Im almost finished with world 8 except the castle and towers. The loop sprite is giving me nightmares on how to work. Ill guess I will just leave it with a warp to level sprite when you entered the wrong path. 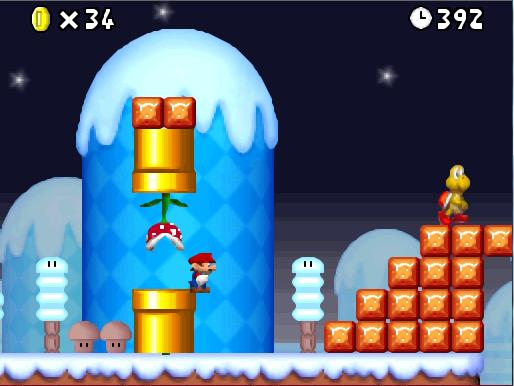 I have managed to get it work in 4-tower, however it changed the level layout a little. I remember I had more than 1 warps in the same area and they worked perfectly. sometimes they crash for me too.